When it comes to Magento 2 free themes, you may ask: which vendor should I choose? While today there are many vendors that make Magento 2 free themes, the vendor that started them all was, apparently, Magento. On November 17th, 2015, Magento launched Magento 2.0, which started the glorious series of Magento 2 free themes. The two classic default themes for Magento 2 were: Luma and Blank. After that, other vendors started to make Magento 2 themes, inherited from default or "from scratch", premium or free. On the publication of this post, there are 72 premium Magento 2 themes on Themeforest, 114 Magento 2 themes from Template Monster. In this post, we will compare the differences between the free themes made by Magento, and the free themes made by Other vendors. For themes made by Magento, you can browse our online live demo. For ones made by other vendors, you can browse our list of best free Magento 2 themes. Other vendors are making Magento 2 themes too. Some of them are good and active, while most are forgotten. You can browse our list of best active free themes here. Great animation: Many themes are filled with beautiful animation. One of the themes with good animation that we can find is Bentriz, with slow and creative animation. This makes the theme smooth, and the user comfortable when browsing the website. Various design: There is a variety of beautiful design, that attracts website visitors at first sight. 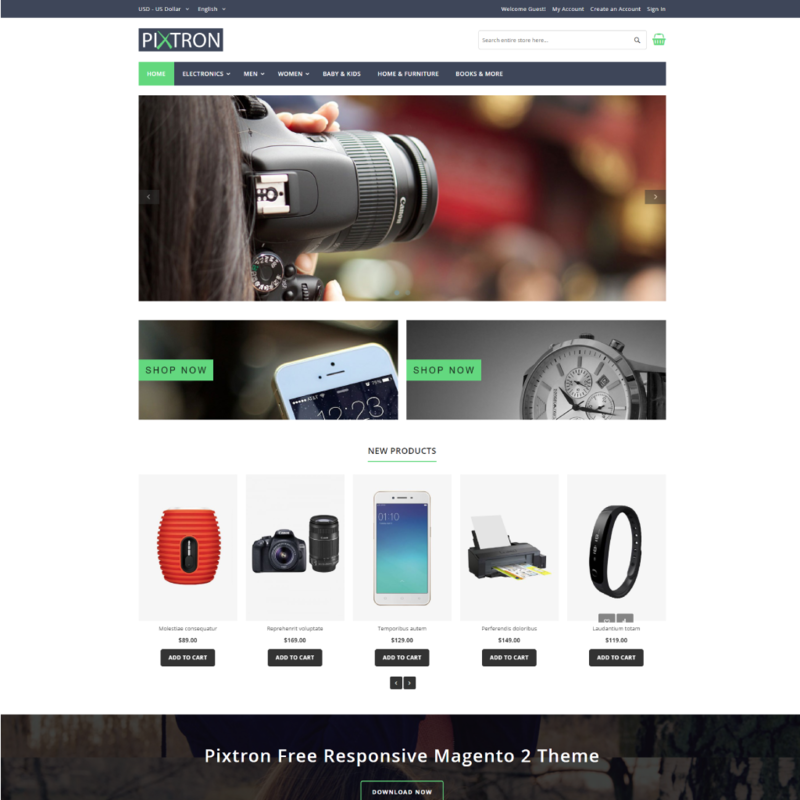 For example, Pixtron is our most favorite Magento 2 free theme regarding design. 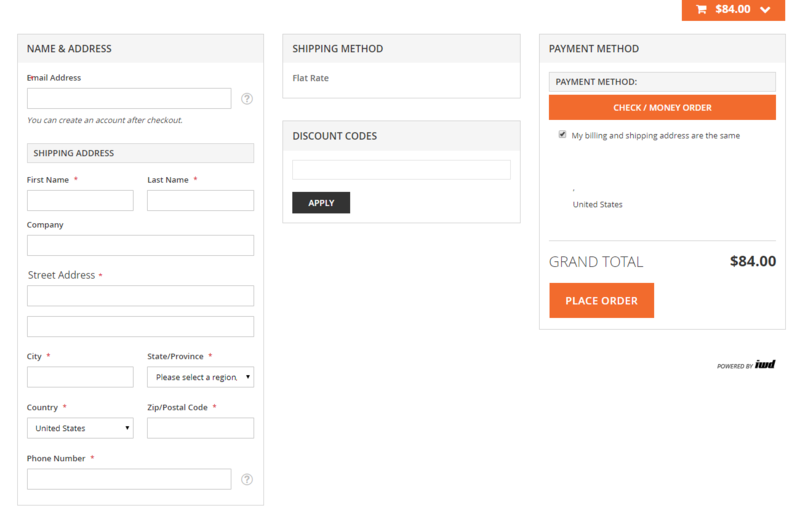 AJAX Add to cart: makes adding-to-cart smooth by not having to reload the page. Banner slider: gives your website a catchy first look by a banner slider. Fast checkout: let users fill out the form in just one page to reduce the drop rate of users in filling out checkout forms. Many bugs: Some themes have easily notable bugs. 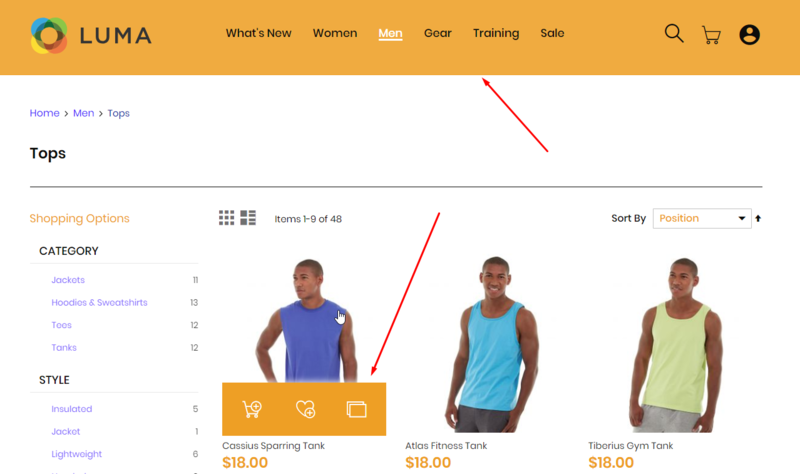 For example, in Ves Kasitoo homepage, at the publication of this post, hovering the product in the second row triggers the hover effect of the product in the first row. Easier to conflict with other modules: Comparing to Luma and Blank, the rate of conflicting with other extensions that you would add to your website is considerably higher when you choose other vendors' themes. Easier to get color conflict: The themes from other vendors are usually filled with colors that are non-neutral. For example, let's take the theme Citrine. Let's say my brand color is blue (color code: #002aa7). I go to the color configuration of the theme and choose the color to be like this. However, in the front-end, the blue color is not applied to all of the sections I want. There are still many sections that have the main basic color of the theme (yellow). This causes color conflict. This makes my website looks chaotic. I would have to discard this theme and find another theme that would give me more control over the color options. 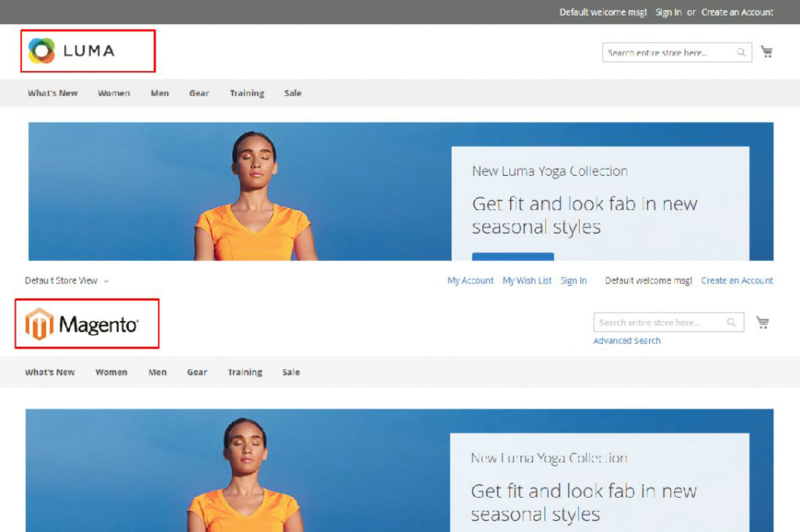 Magento only makes two themes for Magento 2: Blank and Luma. Luma is the child theme of Blank, so it is clear that Luma has several attributes from Blank. However, Luma and Blank still have some differences regarding design. Fewer bugs: Being the default theme of Magento, Luma and Blank have been tested thoroughly and carefully. We have found no functioning bug of these themes. Fewer conflicts with other modules: Luma and Blank are the default themes of Magento 2, making them the most used ones for module developers. For example, all of BSS Commerce's Magento 2 modules are developed and tested with Luma theme. This makes all of the bugs that originate from the conflict of the module and the theme have already been fixed when the module makers develop the module. That's why when you use Magento 2's default free theme, you would not need to worry about module conflict. Fewer conflicts of color in design: Unlike premium themes, free themes usually come with very few configuration options. One of the most commonly neglected configuration options for free themes is color config. If you are new to website design, you would NOT want your website to be filled with too many colors. In fact, when designing the website, designers often use a color palette to convey the desired feeling when customers think of the brand. That makes the brand easier to memorize, regarding visual clues. For starter, you should have a color palette of your main brand color(s) (usually the same as the primary color(s) of your brand logo), and some neutral color like black, white, or gray. All of the sections of your website should follow this palette to create a sense of synchronicity and unity. So if a free theme's background color, for example, is yellow (non-neutral) and not configurable, you would run into trouble if you have a blue logo. The colors used in Magento 2 Luma and Blanks are mostly neutral colors (mainly different shades of gray and white). This makes these two themes easily compatible with any brand regarding color. Too basic: The design may be too basic to use for products that need sophistication: cars, or jewelry. Lacks UX optimization features: The themes lack many functions that optimize user experience. Almost no animation: Luma and Blank, most notably, barely have animation in any interaction with users. By now we hope that you have had a glimpse on the differences between using free Magento 2 themes made by Magento and Other vendors. Magento's free themes are more safety regarding both technical and design aspect. While that can be too basic for you, you can have a try at other vendors' more fancy themes with a lot more variety in design and functions. Do you have any question regarding Magento 2 free theme vendors? Let us know in the comment section below, and we would love to help! 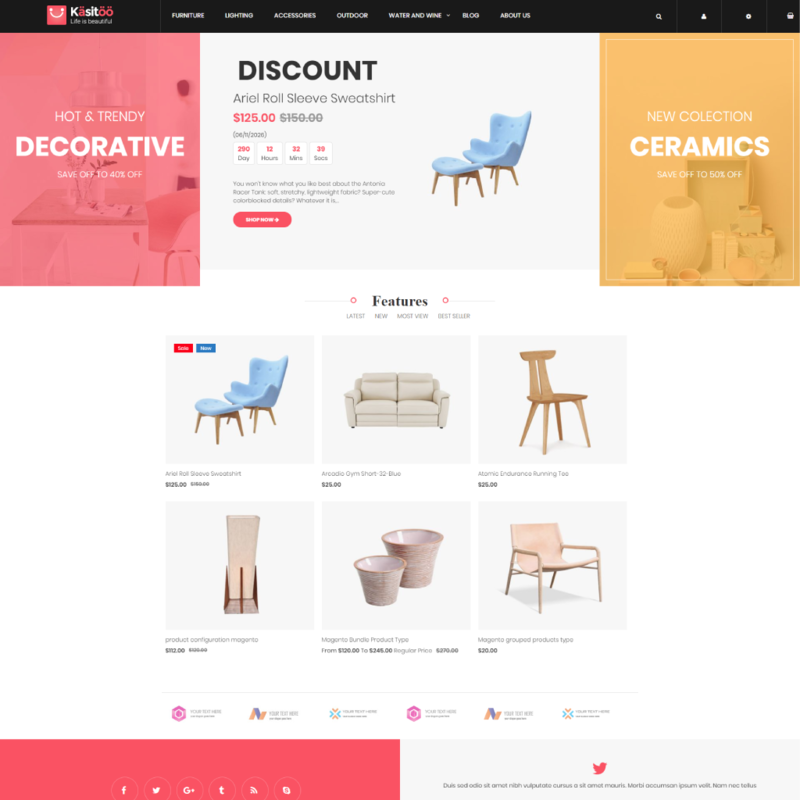 If you want to browse BSS Themes' free Magento 2 themes, click the image below to browse Citrine.